← And you write because? What is it about a literary reading? What is it about a literary reading? Let’s call it Risk City – not only do you as a writer take a risk when you put words on paper and share them with a reader, but at a reading there’s the added dimension of sharing your words aloud and owning them in a public setting. That’s a reading. That’s a risk. However, it’s also an empowering event and a validation. You’re putting your words, your thoughts, and your stories out there and they matter. When you walk onto that platform or into that arena, you are very much on your own. The butterflies may be active as you center yourself, feel your voice, feel the room, and sense the audience. But once you begin, adrenalin is your friend, and it’s just you and your words and the audience. It’s both solitary and communal. It’s a journey and you invite the audience to come along. And now you must not only address the words on the page, but your voice, your eye contact, your reading pace, your pauses. Your lighting may be good or bad, there may or may not be a sound system, the acoustics in the room may be great or horrible. You may have a full house, you may have only one or two people, or just your aunt and cousins in the first row. You have to tune into the variables. You may be in a bookstore or a meeting room or a gallery or a private home or a library. The key is to assess and adjust quickly. 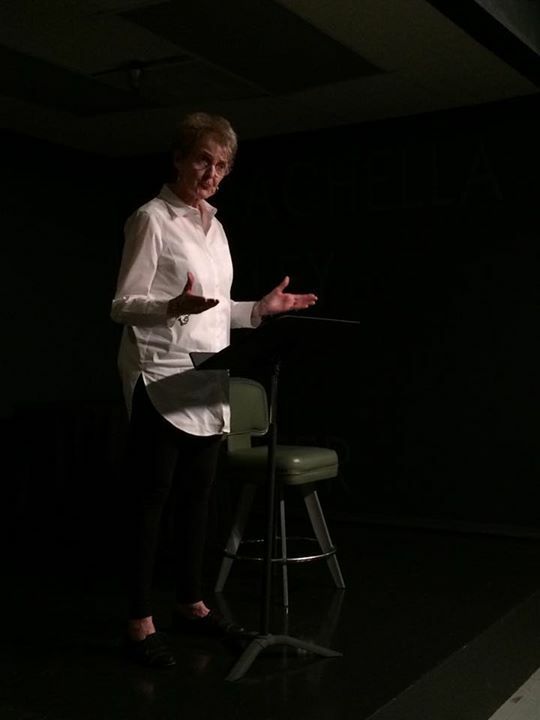 I recently did a reading at the Coachella Valley Art Center, the source of these photos. The room where the reading was held resembled a small black box theater with a raised platform for a stage and good acoustics. 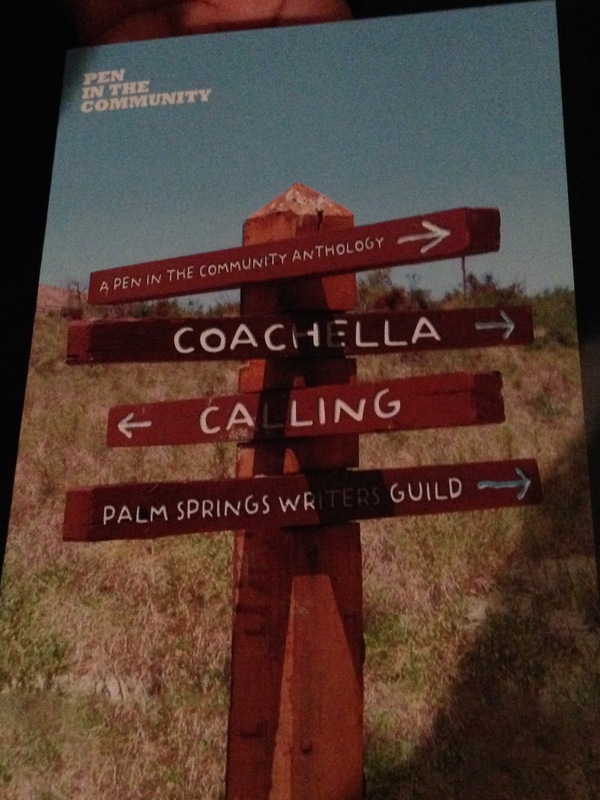 Seven authors read from their work compiled in the anthology Coachella Calling. The personal essays were about a moment of time, a piece of life: its joys and sadnesses, its trials and triumphs. 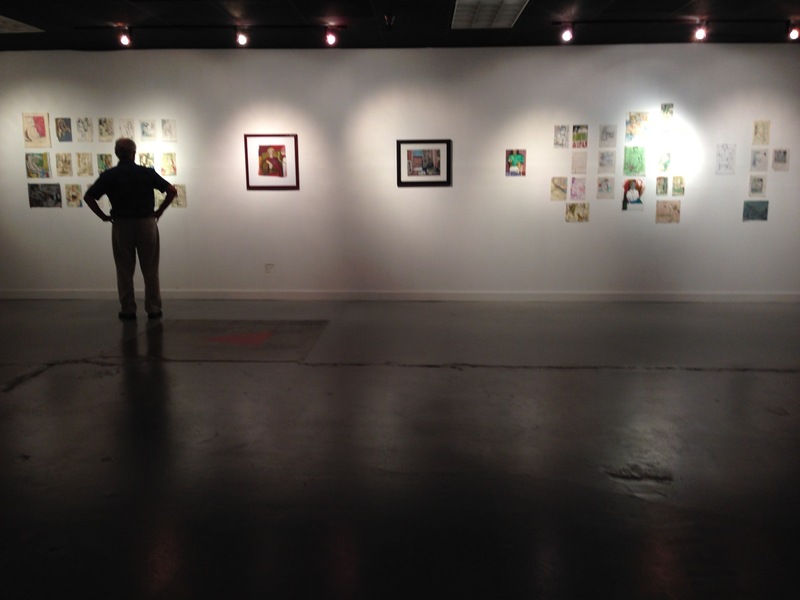 The event was coordinated by PENCenterUSA and the Palm Springs Writers Guild. The distinction between a personal essay and a memoir? One is short. The other is book length. If you’re doing a reading, you may want to put your material in a slim black notebook. That way, if there isn’t a podium or music stand, you have an anchor for your sheets of paper. You’ll want to time yourself – 750 words takes about 5 minutes, give or take. When you’re on the bill with other authors, it’s professionally courteous to adhere to pre-established time limits. You’ll want to practice. The audience is giving you their time. Make it worth their while. What I have found, no matter how you analyze it, the key is to prepare, relax, and have fun. If you do that, your audience is ready to come along and enjoy themselves. (And if the audience seems restless, you may have learned something about your writing or reading persona to improve on.) Hopefully, you’ll hear them laugh at a funny line or grow quiet when the scene is tense, you’ll feel them sense the fun and sense the drama. You’ll know they’re with you. Photos courtesy of Reg Centeno and Maggie Downs. This entry was posted in Authors, Books, Creativity, Inspiration, Looking for Inspiration, memoir, Reading, Writing and tagged Coachella Calling Anthology, Coachella Valley Art Center, doing a literary reading, essay, Palm Springs Writers Guild, PEN Center USA, personal essay, risk, writing. Bookmark the permalink. 6 Responses to What is it about a literary reading? Carol: I must say you were sure up to the challenge! First experience for me and I found it most enjoyable …..quite a risk inviting an engineer-type. Keep up the good work! Murray PS. Super neat it tied in with Tony’s B-day celebration. Thank you, Murray. Glad you enjoyed the evening. The pieces were so varied and unique. I had not heard them read in their entirety until the reading. Compelling. It was a special evening with special friends, and an extra-special birthday celebration for Tony! Great post , Carol. Thanks for exposing us!!! Thanks, Judy. Ah, yes, it is what it is! Glad you stopped by.